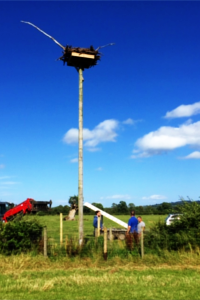 "Friends of the Ospreys" volunteers, led by a core group, including Darren Moore, Lenny Watson, Mel Griffith and Drew Murray, have built 9 nests on the Glaslyn Estuary and several more at other sites in North and Mid Wales. Many more nests are planned for the near future throughout Wales and England. We build a variety of different nest-types, some in tall trees and others, where no suitable trees are available, atop 10m + utility poles. Some pole-nests are erected within the branches of stunted oak or scrub woodland, with the nests protruding through the canopy. We always fit our pole-nests with natural, antlered, heart of oak perches. We have had several failed breeding attempts at our nests over the years, but success finally came in 2012, with 1 young male bird fledged. This was a fantastic outcome, as the parent birds were inexperienced 1st time breeders and they succeeded despite prolonged and atrocious weather conditions from egg-laying through till fledging. So cold and wet was the weather during the summer of 2012 that many, more experienced, UK Ospreys failed to rear any chicks at all. We hope that 2013 will be even more successful for our new breeding pair and also for other pairs of Ospreys which have visited our nests in 2012. Our nests are fitted with sophisticated surveillance devices, and protected around the clock by numerous dedicated and committed individuals. Ospreys are the only avian predator in the world to be solely reliant upon a diet of fish. As such they are an 'indicator species', in that any problems in a region's waterways will be first noticed in the local Osprey population. It was the low productivity of the 1960's North American Osprey populations which first alerted the authorities as to the toxic effects of the agricultural insecticide DDT on the environment. 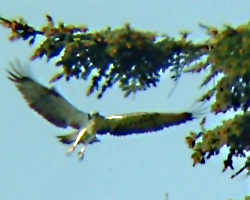 As a result, new legislation was introduced, banning the use of this pesticide and Osprey populations eventually recovered. Ospreys are a sign of a healthy environment, and their presence should be encouraged by both conservationists and fishermen. Ospreys do not have a negative impact on fish stocks. FOO hope to assist in raising the status of UK Ospreys to their pre-persecution days, and for them to become a common UK breeding bird once more. 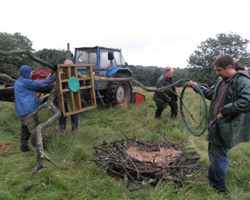 We work closely with Roy Dennis, The Rutland Osprey Project, and Rolf Wahl of the French Osprey Project. 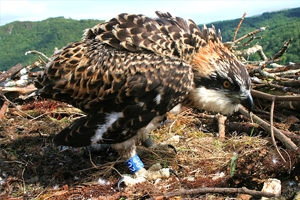 A second pair of ospreys has successfully bred in Snowdonia.